New York-based D.S. & Durga has released a large number of fragrances in a very short time; there are two feminine and two masculine perfume collections — 18 perfumes total. I finally got up the energy (and set aside a week) to wear six perfumes from the men's lines, and I was pleasantly surprised at the quality and variety of the perfumes. Judging from the name, Cowboy Grass, I was expecting something a bit "tougher" and wilder. If there were any 'cowboys' in the minds of Cowboy Grass's perfumers, those boys live on a fancy rancho, not on the open range, and they are fresh out of sudsy tubs — scrubbed, shaved, and scented — their jeans, shirts and bandanas ironed to perfection. Cowboy Grass begins with a 'dusty' accord that brings to mind New Mexico — my desert area of choice; there's a hint of incense, a touch of sage-herbs-vetiver. If you've ever been in the desert and rubbed sage between your fingers or smelled creosote or burned small bundles of sage smudge sticks, you can perhaps conjure the aroma of Cowboy Grass, but its overall effect in person will be smoother, cleaner and sweeter. As the perfume dries down, it becomes more resinous-vanillic. This fragrance would wear well in any season, as long as the summer heat is dry, not humid. "Old men in coastal New England towns like Marblehead, MA sport red pants and smell of chypre," says D.S. & Durga — any Marblehead residents out there who can confirm this? Marblehead Reds, the chypre of the collection, opens with oakmoss-bergamot — crisp and old-fashioned; the fragrance "blooms" quickly with orange blossom and anise mingling with the mossy notes. Anise becomes more apparent during the dry-down and gives the perfume a slightly "candied" aroma (but a hint of astringency remains and keeps the fragrance from becoming too syrupy-sweet). The base of Marblehead Reds reminds me of a Brazilian rosewood soap I used to buy ages ago: it was a nice combo of menthol, patchouli and sweet, full-bodied wood notes. Barbados, a rich bay rum-type fragrance, opens with liquor-y, pungent bay leaf and spice (nutmeg-clove) notes; "leafy" and sweet lime peel aromas emerge quickly and linden blossom adds an unexpected floral-tart touch to the still-spicy dry-down. If old men in Marblehead, MA, wear red pants and smell of chypre, the old men where I grew up in coastal Virginia wore hats (everything from Panamas, to trilbies, to fedoras with pheasant feathers tucked inside the hatbands) and smelled of bay rum. I've never worn bay rum because I associate it with shaving/grooming and not perfume-wearing; (it also reminds me of my — dreaded — childhood Sunday school, where the minister, my teacher, and many male congregants were saturated with bay rum). Barbados is a fine bay rum fragrance, but with all the high-quality (and reasonably priced) bay rums on the market*, why create a "new" bay rum, especially one that sells for $85 for 1.3 oz.? $ (Money) is one of my favorite D.S. 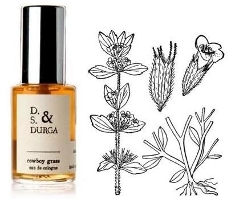 & Durga fragrances; it smells festive and dressy with delicious, crystalline tonka and musk notes and a persistent citrus-leather-floral accord drifting thru the composition. $ reminds me of the dearly departed (discontinued) Crown Perfumery Eau de Russe, but a stronger, Eau de Parfum-esque version of it. $, in my opinion, deserves a better name — it's much too refined to be symbolized by a crass dollar sign. Clean and "wet," Vetyver's 'vetiver' must be hydroponically grown — it's never touched soil. Don't expect root-y/earthy vetiver in Vetyver, or even vetiver as you smell it in Givenchy Vetyver, Guerlain Vetiver or Chanel Sycomore; expect washed, ghostly vetiver. Vetyver opens a bit fruity, then segues into the cleanest vetiver imaginable. Though Vetyver is part of D.S. & Durga's Solos collection (fragrances built with one predominant note), I smell hints of 'butterscotch', pine, and whitest of white musks in the dry-down. Vetyver's sheerness makes it perfect for summer, and it smells "casual" — the perfect scent to wear to the beach or to a barbeque. Simple fragrances appeal to me — in soaps, talcum powders, candles/diffusers — but I rarely wear soliflores or simple (one-note) fragrances. Juniper (from D.S. & Durga's Solos collection) is an evergreen fragrance with the punch (for a second or two) of juniper berry, the vitality of greenness (a violet leaf-like note) and the aromas of evergreen bark and wood. Juniper smells clean, fresh and sweet (and it makes my skin tingle upon application). 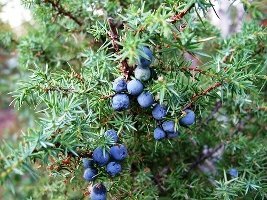 Juniper would be great in home fragrance products or used as a base to build a fragrance upon...or layered with other fragrances. I would happily wear any of the D.S. & Durga fragrances in this group (with the exception of Barbados — yes, we're back to SUNDAY SCHOOL again!) but $, Marblehead Reds and Cowboy Grass stand out for me. It's a good sign that I'm still interested in smelling the other 12 perfumes in D.S. & Durga's line-up. For buying information, see the listing for D.S. & Durga under Perfume Houses; samples of D.S. & Durga fragrances are available upon request directly from D.S. & Durga for $3 each. Note: top right image is Botanical illustration of Acinos arvensis by Britton, N.L., and A. Brown, 1913; Illustrated flora of the northern states and Canada. Vol. 3: 139; via Wikimedia Commons. 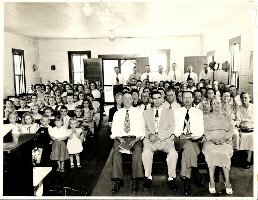 The next image is Braswell Congregational Holiness Church's Sunday School in 1952 available from Old Shoe Woman at flickr; some rights reserved. The last image is Juniper by khianti at flickr; some rights reserved. cherlana32: thanks for the confirmation! Yup, I also can remember grandpa-types on the New England coast wearing Nantucket Reds (they start out red, but the dye fades rapidly with washing, like denims). If they had a beach house, they wore Eau Sauvage, and if they didn’t, they wore Old Spice. The salty oldies in the New England seaports I’ve hung out in (“…seaports I’ve hung out in…”–I loved typing that!) always seemed to smell of clove incense (even the more aquatic airs hinted at clove), like bay rum or “Old Spice”. The closer they were to the sailing life, the more likely to be doused in spice. But regarding the red pants, I don’t know…there were a few stand-out red pants wearers—both accessorizing with tan deck shoes, sans socks. However, blue or white chambray was everywhere. NLB: I searched and searched for an image of a “sea dog” in red pants…rubber, corduroy, khaki-type, canvas…couldn’t find a one! Lovely review(s), Kevin…which sent me scurrying to their equally lovely website. I’m marking this one for exploration later on. Thanks! Exciting review, Kevin — I am absolutely compelled by the Cowboy Grass. Yum. ducks: hope you like it. I order a batch of samples awhile back and am sad to say I wasn’t wowed by them, even though I was really looking forward most to $. $ and Marblehead are the only ones on your list that my samples overlap with, and I haven’t gotten to all of them yet — haven’t even gotten to do a proper test of Marblehead. I’m not sure why I don’t enjoy these more — something about the ones I’ve tried seems rather harsh and “unfinished” and more like new-age-boutique essential oil blends or something. Again, I feel bad as I had high hopes — however, there’s more than enough product out there, so not liking something can be a blessing sometimes: less to crave and spend on. Funny how the scents one’s elders wore when one was a child seem to stick in some hidden area of the brain, isn’t it? My grandfather wore Royall Lyme aftershave, and my father, until recently, wore Old Spice. One whiff of either one of those, and I’m suddenly six years old. Mals86: yes..and sometimes that’s GOOD and sometimes that’s BAAAAAD! HA! Kevin, your description of Cowboy Grass makes me think of Tauer’s L’Air du Desert Marocain. Any similarities? I was just about to ask the same thing, but about Lonestar Memories! Two comparisons, Kevin, if you please? Thank you! I’m waiting to see how my beloved L’Air holds up in the summer — I’ve been told that it’s doable in small amounts. I’m not even gonna look at Lonestar once the thermometer hits around 70, however! Ahsu: definite similarities, esp. in the drydown. I also scored a bunch of samples and overlap with you on Marblehead Reds which I didn’t like as much as you did. Barbados which really came off very nutmeg on me and without unfortunate past memeory connotations I liked it a lot. Cowboy Grass did remind me of a smudge stick too and I liked the cleaner lines of it. I have tried L’Air du Desert Marocain and there aren’t a lot of similarities to my nose. Their website is fantastic! And a lot of the “feminine” fragrances seem very unisex and would be interested in trying out a few of those as well–especially Silent Grove and Cedar. Thanks for the great review and turn-on to a new house! I think I’ll get a sample of each! Zesty: I have to get my hands on some Burning Barbershop, Resin and the Orris…. OK, Kevin… I’m back home now and had to pull out my box of DS&D and try these again, as well as all the others I hadn’t tried before, to be fair. These first two masculine blends are difficult for me, but they’re the ones I tested first because from the descriptions I thought I’d like them best; it was not to be. – $: too much heavy leather for me. – Marblehead: a bit too much mentholated “Icy Hot” liniment vibe. – Beartrapper: I loved the name; it’s a very strong herbaceous hit of woody tarragon; I could see it growing on me. – Burning Barbershop: interesting; you may really like this; to me it’s quite leathery along with the aromatics. – My Indian Childhood: This starts out nicely green/floral but turns a bit soapy on me for my taste. – Rosa Americana: a dark boozy rose, almost plummy; I’d recommend for rose lovers. – Orris Root: deeply rich and beautiful — by all means get some! – Coriander: green, bright, sappy; in the drydown it’s reminding me somehow of green pears — fresh, but neither sweet nor ozonic. Perhaps what Apres la Mousson should have been (i.e., no melon). I may actually want to buy more of this; it would be great for spring and summer. Sorry for going on and on; thanks for encouraging me to revisit these samples. Joe: I’m greatful you “revisited” them — thank you! Must get some orris then…. Kevin, thanks for the wonderful reviews, I will definitely be checking out the Vetyver – if perfect for BBQs it would be nice to wear something that I can sneak a smell off my wrist while something is being charred near by! Jeremy: yes…and you won’t ruin anyone’s meal with your cologne being too strong! You’ll smell it…they won’t. They all sound very interesting, and it’s good that samples can be ordered. And I do want to try out the feminines as well (although lately I’m favoring “masculine” scents). Ines: yep…want to try the feminine line too and see if it IS really “feminine”…almost all the “masculines” I’ve tried recently (mainstream too) are easily worn by women…. Hey everyone!!! This is my IrisNobile comeback… I just picked a new name:)) I am totally into lavender this year so I chose Lavandula… anyways, I’d love to try Barbados! I love fragrances with a rum note… ummm. Great article, Kevin! Lavandula: thanks…and may lots of great lavender fragrances find their way to you…. Kevin…I guess I was asleep on this line…and right here in Brooklyn? There a def a few that I would be interested in trying. Thanks for the helpful info on this line. C: Wake up then and get some of those scents … I can see you liking several. I have wanted to try each and every one of the scents in this line ever since Robin’s introductory post. From their humble beginnings of making shaving products to “when they realized that none of their friends shaved” they switched to perfumes just tickled me. Picturing heavily bearded yet wonderfully smelling men makes my heart melt. Plus, for being a niche line, they just seem so unpretentious to me! Bonus! Excellent review as always! Miss H: thank you..and the line is definitely worth sniffing…. For some reason their Burning Barbership scent made me laugh; still need to sample that one.